Best kid-friendly costumes, keeping in mind of the hot Florida weather! Camera/Phone – for lots of pictures! 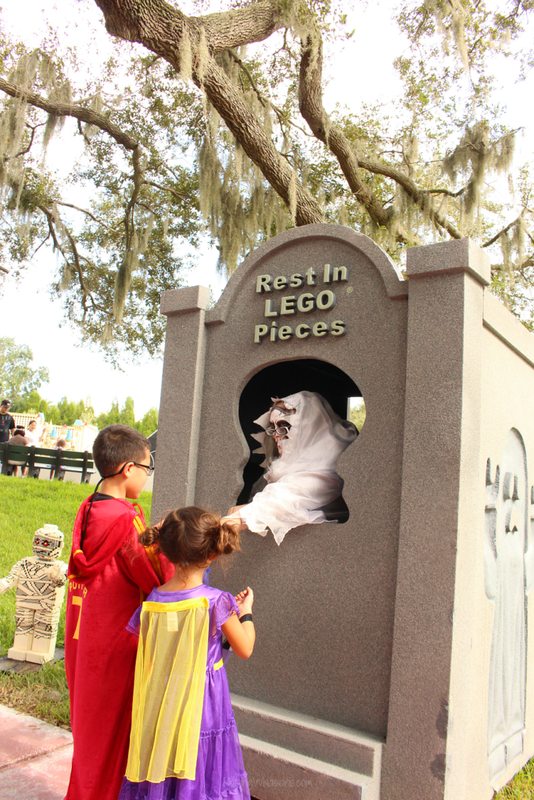 LEGOLAND Florida Brick or Treat offers a ton of exclusive Halloween themed character experiences during the event – making it possible to see your spooky favorites! Plan to see at least one of these character meet and greets during your visit. Best Tip: keep an eye on the lines. If they’re too long at the beginning of the 30 minute time block, come back towards the end for shorter wait times! This jamming group of spirits love to drum up some fun! Check out all of the beats at 15 minute The Groovin’ Graveyard musical show on your way into Fun Town! Best Tip: Combine this show with a character greeting and/or Fun Town LEGO Build to maximize your time! 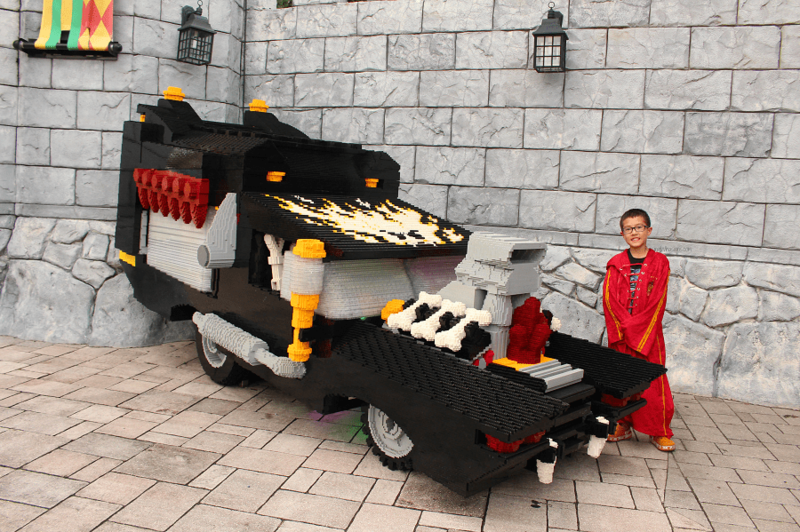 There are always fun LEGOLAND LEGO builds for kids during their special events. 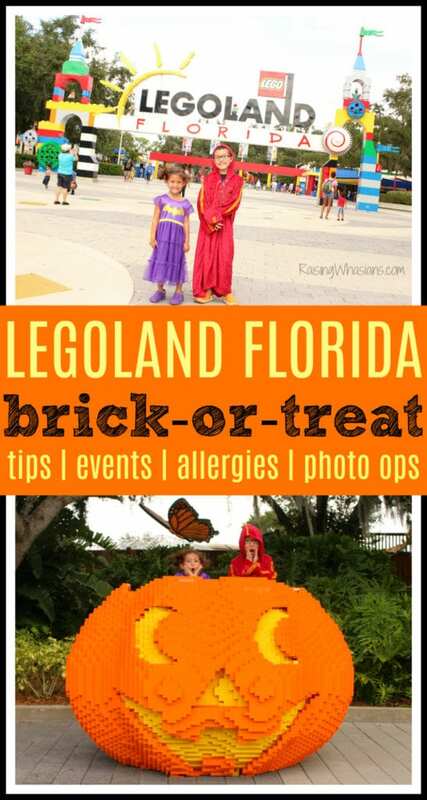 And for LEGOLAND Florida Brick or Treat, there are 3! Take advantage of having your family complete at least one of these fun builds during your day, a must for your Master Builders. Best Tip: The LEGO Mosaic is not available on 10/31. I would suggest at least participating in that one! 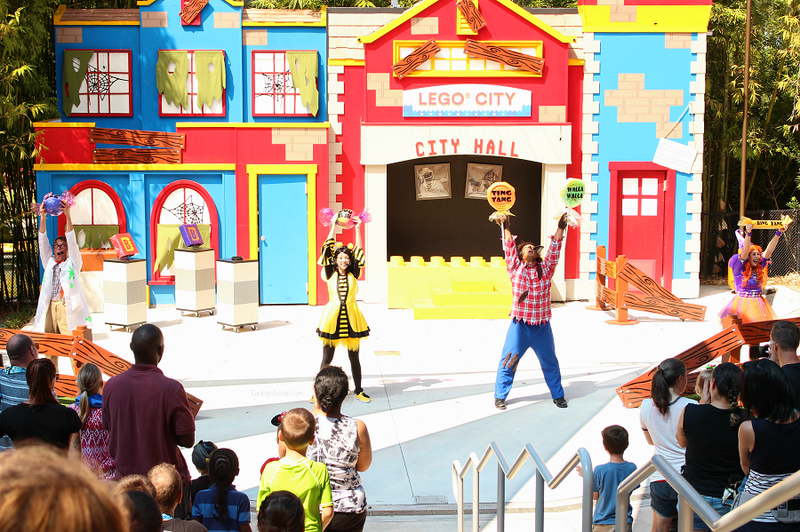 There’s a new 15 minute stage show over in LEGO City! Kids of all ages will love helping to solve the mystery as characters dance, sing and chant their way through the show. Best Tip: Get there early. Since this is a new show offering for Brick or Treat, it’s expected to be popular! 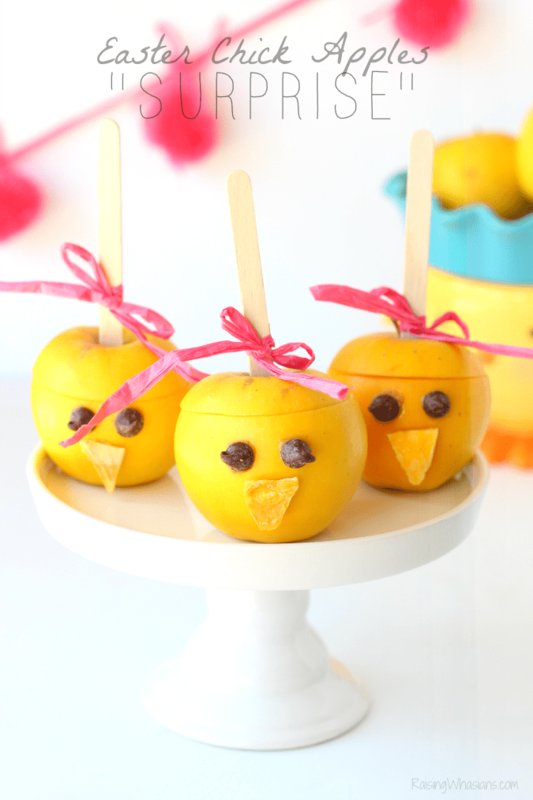 Stay to the end of the show for a sweet treat for kids too! 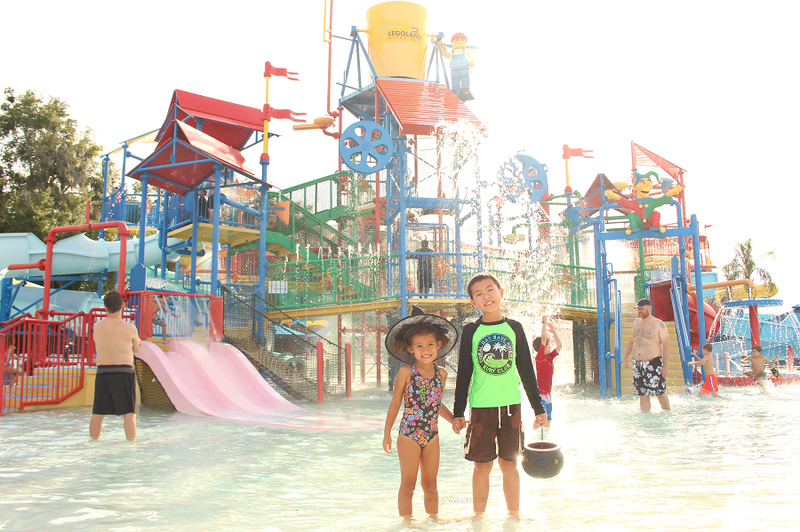 Head to LEGO City afterwards for the fun rides or head over to the water park to cool off! No matter how many you find, don’t forget to turn it in at the end of the day for an exclusive LEGO souvenir! Best Tip: What’s great about this scavenger hunt is that you’re not locked down to a time crunch. So do this at your leisure, in between all of the other exclusive Brick or Treat timed events. 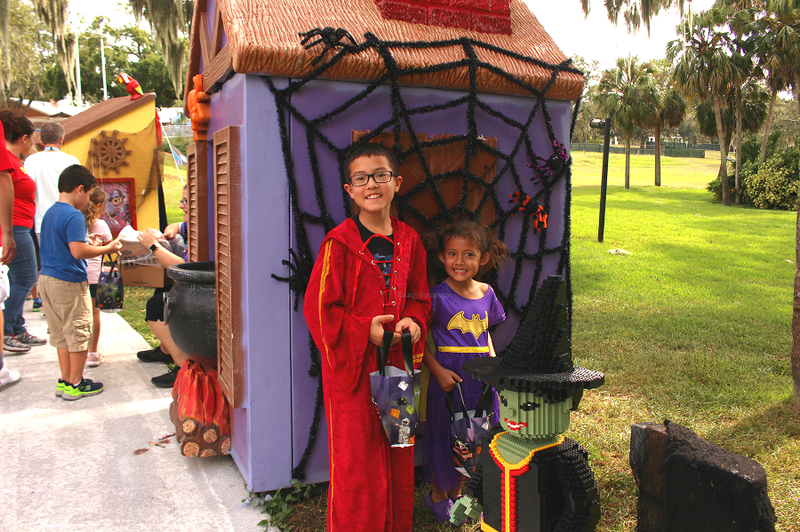 Walk the Brick or Treat Trail for Sweets! Kids 12 years and under can take a walk through the Brick or Treat Trail between 3-7 pm to grab lots of tasty sweets at little booths. Keep in mind that some of the folks passing out candy have some ghoulish face paintings and creepy booths – so little ones may want to hold a hand while they walk. Best Tip: Your kids will receive free bags to collect their treats. No need to bring one! It wouldn’t be a LEGOLAND Florida day without the rides! Take advantage of all of the fun family rides open during Brick or Treat, especially since park hours extend to 8 pm! Best Tip: With so much to explore during Brick or Treat, I would definitely recommend keeping the wait times short! Come back later if your favorite ride is too long. Add the Water Park on Hot Florida Days! It’s October and still over 90 degrees. Hello fall in Florida! What’s great about Brick or Treat is that the LEGOLAND Florida Water Park is also open during the events (closes at 5 pm daily). So you can easily add on the water park option to your ticket…because we know how hot those costumes can get! Best Tip: Let your kids wear their bathing suits under their costumes – less complaints knowing they will be cooling off soon! 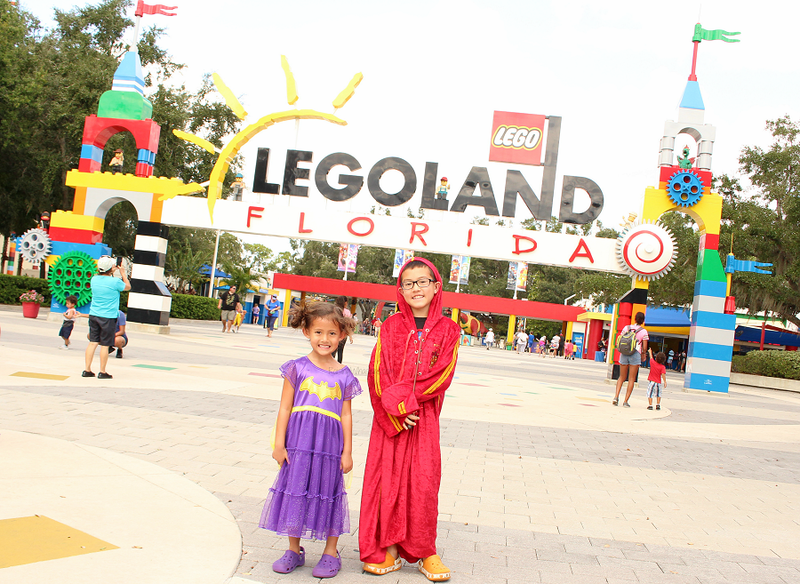 Love those memorable LEGOLAND Florida photos? 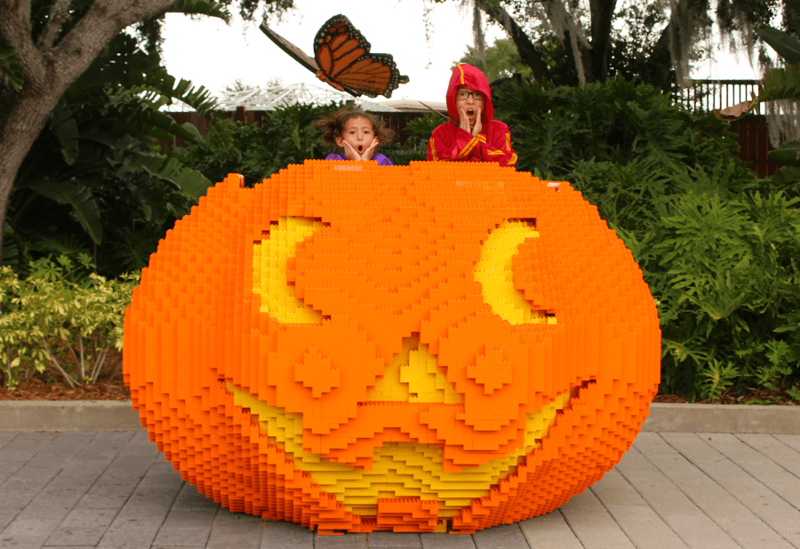 Don’t forget to take that priceless family photo at one of the exclusive Brick or Treat model photo ops, including the world’s largest LEGO pumpkin! Best Tip: both of these photo ops are better at night, when they glow! Go just around sunset for the best possible lighting! Does your child love to dance? Be sure to head over to the Monster Bash dance party for music, lights, bubbles and “monster friends!” This is a continuous dance party from 5-7:30 (LEGO characters will rotate) – a perfect boo-gie break for your little ones! Best Tip: If you go towards the end of the dance party (before 7 pm), you can head next door to Pirate’s Cove to grab your free 3D fireworks glasses. And why do we need those fireworks glasses? 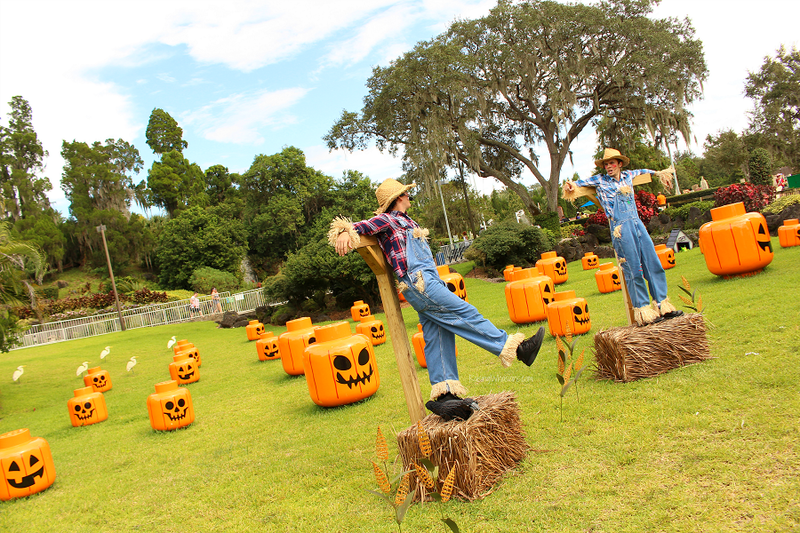 So you can end your LEGOLAND Florida Brick or Treat weekend with a bang! Head over to Pirate’s Cove to watch the sky light up during this 7 minute show, The Tale of Pirates’ Cove – a Fireworks Spectacular! 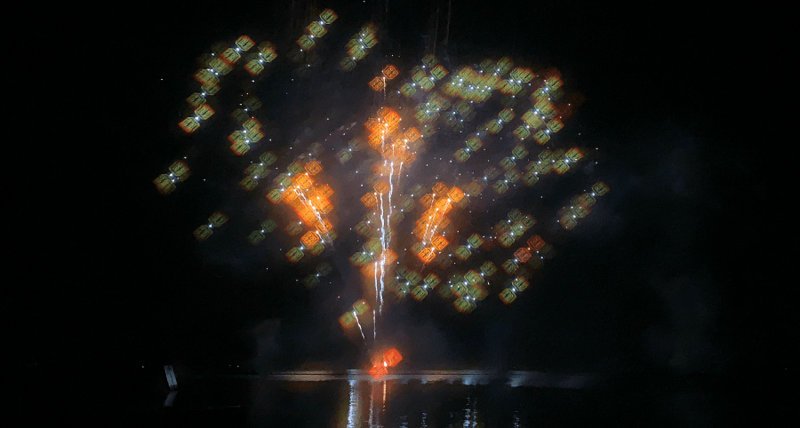 Best Tip: Head over to Pirate’s Cove by 7 pm to grab a pair of exclusive 3D fireworks glasses to see the fireworks in the best “LEGO” lighting! Music fills the air with these LEGO Jack O’ Lanterns! Be sure to catch them before you head home as they will be singing some spooky tunes as you leave. Best Tip: They will be singing from 7 – park closing. Definitely catch a photo and video as these pumpkins glow in the dark while they sing! 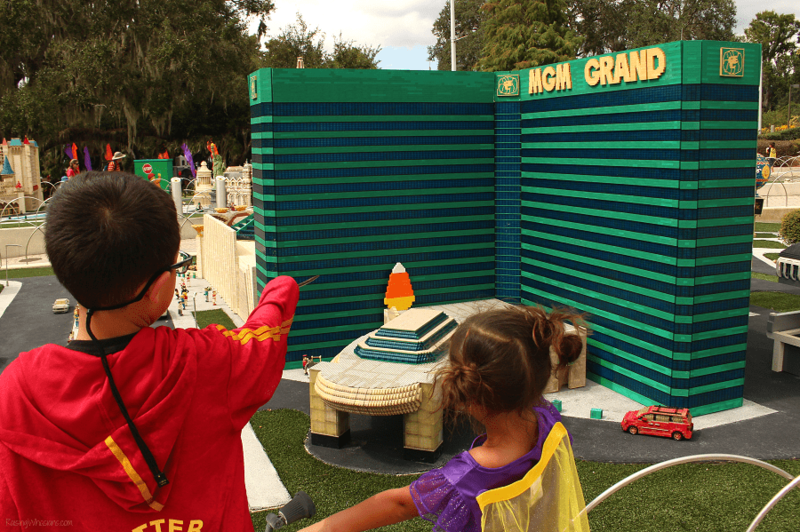 Want to see what it’s like at the 2018 LEGOLAND Florida Brick or Treat? Check out our Best Brick or Treat Tips YouTube video of the day! 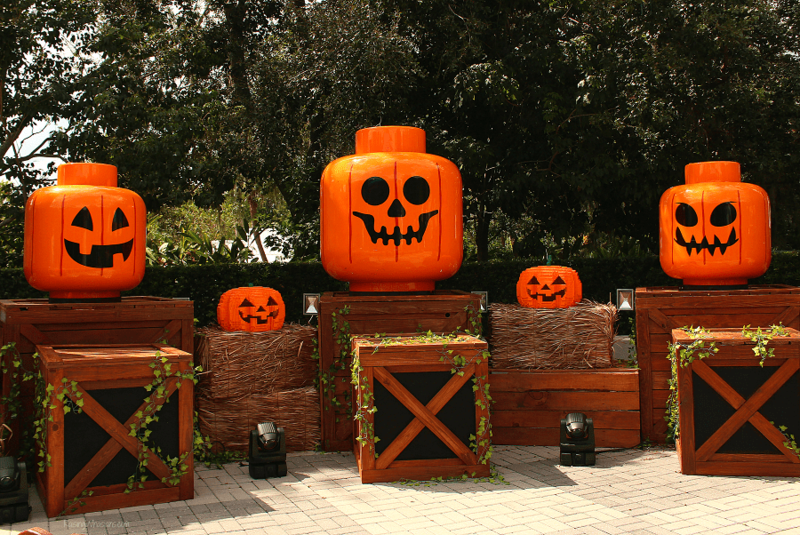 LEGOLAND Florida Brick or Treat 2018 is only here for a limited time! Be sure to catch this exclusive festive event only during the month of October. Dates: October 6, 7, 13, 14, 20, 21, 27, 28, 31. I highly recommend bringing the kids – at least once! Hope you’ve got lots of great LEGOLAND Brick or Treat tips for your family – so you can make the most of your festive visit! Be sure to follow along all of the spooky fun with hashtag #BrickorTreat on social. 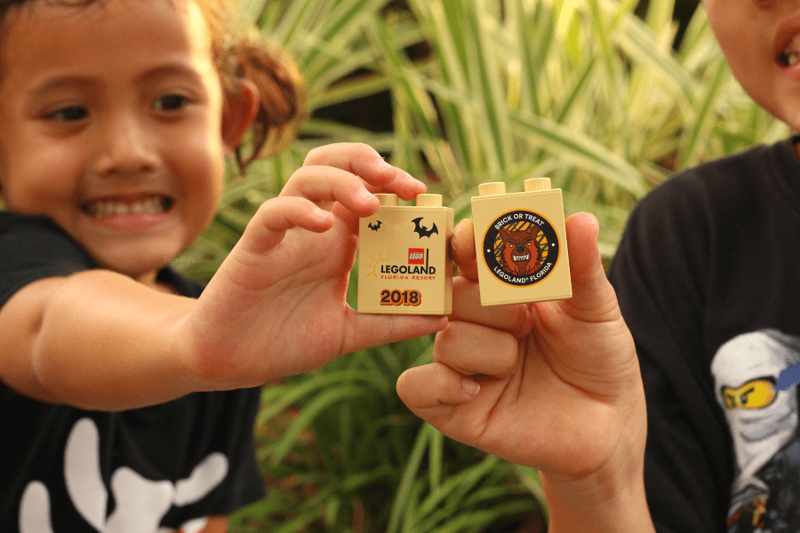 Follow LEGOLAND Florida via Facebook, Twitter, & Instagram for the latest updates – including special deals, hotel offerings and more. 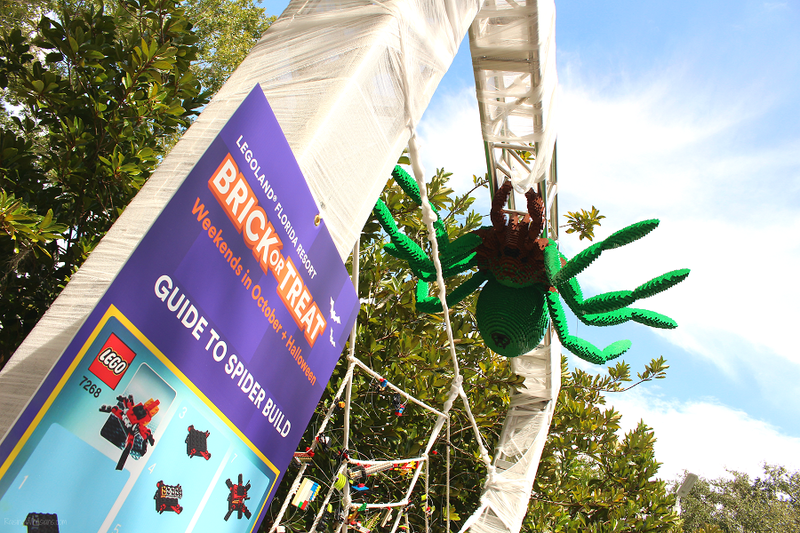 What are your best LEGOLAND Florida Brick or Treat Tips? Looking for more family travel tips? 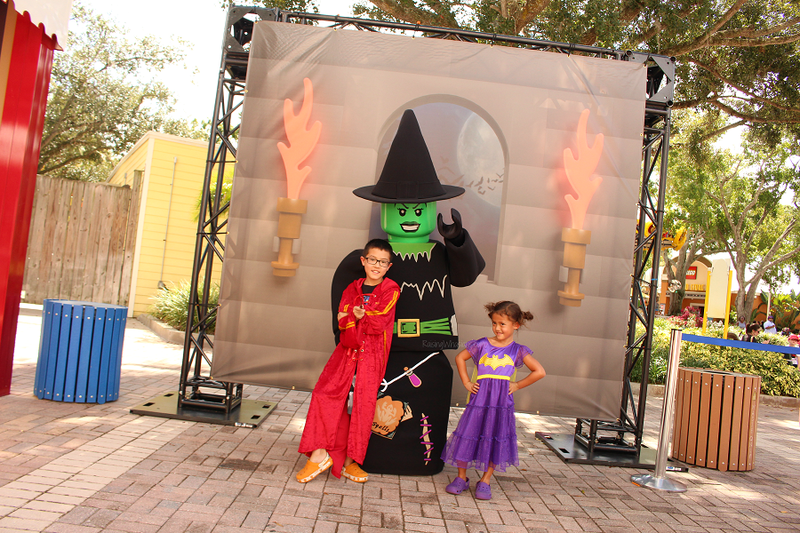 I was invited to attend a media event for these Best LEGOLAND Florida Brick or Treat Tips for Families. Be sure to follow Raising Whasians via Facebook, Twitter, Google, Instagram, Pinterest and YouTube for family travel tips, recipes, crafts and more.